John Truby, in The Anatomy of Story, writes: "creating a unique world for the story--and organically connecting it to the characters--is as essential to great storytelling as character, plot, theme, and dialogue." When I read that passage I knew I couldn't close out my series on narrative setting without talking about how Truby constructs a story world, a narrative setting, one designed specifically for his characters. Truby talks the reader through how to create a story world that characters not only 'hook' into, but which complements the hero's journey and gives it meaning. Truby writes (and this is something he emphasizes all through "The Anatomy of Story"): just as the interrelations between the characters--especially the protagonist--give meaning to the whole, so it is for settings. 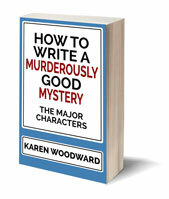 "... in good stories, the characters come first, and the writer designs the world to be an infinitely detailed manifestation of those characters." "The process of translating the story line into a physical story world, which then elicits certain emotions in the audience, is a difficult one. That's because you are really speaking two languages—one of words, the other of images—and matching them exactly over the course of the story." 1a. 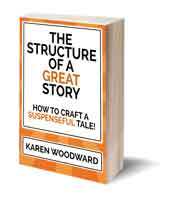 Use the story's designing principle to draw the boundaries of your story world. Begin with the story's designing principle "since this is what holds everything together." The designing principle will tell you where to draw the boundaries, what shape the world should be, what kind of world it should be. 1b. Divide the story world into visual oppositions. Divide the story world we delineated in step one into "visual oppositions" based on how your characters oppose one another. 2. Three types of setting. Truby advises us to "detail the world using ... natural settings, artificial spaces, and technology." 3. Connect the story world to the hero's overall development. When I read this part of Truby's book I knew I had to share this information on my blog. This point is really why I'm doing this post, we're going through steps 1 and 2 because they're prerequisites to get here. SO. Let's take this one step at a time. 1a. Use the story's designing principle to find the boundaries of your story world. First, let's quickly discuss the designing principle. This is one of the core concepts of Truby's "The Anatomy of Story" so I'm not going to be able to do it justice here. "The designing principle is what organizes the story as a whole. It is the internal logic of the story, what makes the parts hang together organically so that the story becomes greater than the sum of its parts." Designing principle: "Force a male chauvinist to live as a woman." What we want to do is develop a one line description of our setting, something that will tie it into the designing principle of our story. Designing principle: "A group of friends experiences four Utopias (weddings) and a moment in hell (funeral) as they all look for their right partner in marriage." Story World: "The Utopian world and rituals of weddings." John Truby gives many more examples in his book, and I should mention that I'm leaving out an enormous amount of material--the story premise, theme line, and so on. Anyway, after you write down the designing principle you're equipped to delineate the extent of the story world, to clearly establish its physical boundaries. Truby writes that the story "arena is the basic space of drama. It is a single, unified place surrounded by some kind of wall. Everything inside the arena is part of the story. Everything outside the arena is not." Truby goes on to say there are four main ways of creating a story arena that possess enough "variety of place and action" to sustain the events of any story. Think of a medieval town surrounded by thick walls. Many inhabitants of the town could have a general overall knowledge of the town and how it's laid out, its various areas, and so on, though a particular individual might spend most of their time in only a few of its many environs. For example, when I watched the movie "Aliens" I had a general sense of the planet but Ripley only travelled to a few places on its surface. In terms of my analogy, those are the spots within the umbrella. This is the basic layout of a journey story. One of the challenges of writing a cohesive journey story is making all the different areas seem connected. What one usually doesn't want is for the reader to feel as though each location is a different story. You want them to feel it's all part of one unified tale. One way to create "the sense of a single area" is for the terrain the hero travels through to remain fundamentally the same. For instance, a hero might travel to several different villages located along the same river. Or the hero might travel to several locations in the same desert or country. Truby gives the movie "Titanic" as an example of a story where the hero travels in a straight line. This approach has much in common with the previous one, with the exception that, at the end, the hero returns home. Truby's example: "The Wizard of Oz." The fish out of water story generally utilizes two different worlds. In one world, the first, the hero is seen to have certain talents (or weaknesses). Then the hero is unceremoniously tossed into a second world--one where the rules are markedly different--and those same talents (or weaknesses) are shown. Often, whatever the hero did well in one world he will be completely incompetent at in the other. Of course, the two worlds aren't necessarily different physical places. Something could happen to so completely alter the social environment of the hero that the change is just as profound as a change of place. For instance, the hero's five older siblings die in a tragic accident and so he goes from completely ignored to being continually doted on. Truby's examples: "Beverly Hills Cop," "Crocodile Dundee." Note: Truby writes: "What holds them [the separate locations] together is that the hero uses the same talents in both places ..."
Truby's tip: Don't stay too long in the first area. Truby doesn't like talking about acts, but I'd say, in a three act story, be sure to take the hero into the second world--the special world of the adventure--at the beginning of the second act. What are the oppositions between my characters? How do your characters fight each other? How do their values conflict? As you ask and answer these questions think about how these oppositions could be symbolized or represented visually. Truby advises writers to attempt to produce three or four critical, visual, oppositions. Truby uses the example of "King Kong." The opposition is, in part, between "Carl Denham, and the giant prehistoric beast, Kong. So the main opposition within the story world is the island of New York, the man-made and overly civilized but extremely harsh world where image-maker Denham is "king," versus Skull Island, the extremely harsh state of nature where Kong, master of physical force, is king." An ocean has two parts: the surface and the deep, dark, depths. The surface of the ocean gives us a sense of contest, a sense of "a game of life and death played out on the grandest scale." - A weightless dream world. In the deep places sea creatures reach up to grab those on the surface and drag them down to their death in the murky depths. Also, when I think of the deep places of the ocean, it occurs to me that often bodies of water are used to symbolize the unconscious mind and the creatures/complexes it harbours. The forest is a natural cathedral. "It is the place where contemplative people go and to which lovers sneak away." The forest is also where children get lost and witches live. There may also be a ghost or two and we wouldn't be surprised to see a hunter stalking his prey. John Truby talks about many other kinds of natural settings: outer space, jungles, desert and ice, islands, mountains (the mountain vs the plain), plains, rivers, weather. But I'll let you read about those in Truby's excellent book. Truby writes that each man-made space "is a physical representation, in microcosm, of the hero and the society in which he lives." I'm only going to go over one of Truby's examples: the house. A house encloses a character and "shapes the growth of the person's mind." Houses are intimate. They are spaces where your character can express himself without fear of ridicule. Question: What might your hero reveal about himself in his house that he wouldn't anywhere else? Generally, we think of a house as a place of safety. It's a place for you to relax and take refuge in, it's a place for you to enjoy your friends and family. No hostile forces are allowed in. In this sense, a house is a place of safety. BUT if the hero remains always in a safe place he will never grow, never achieve anything. He will stagnate. Truby writes that the trick is to use the house as "the strong foundation from which we go out and take on the world." "Often in stories, the first step of adventure, the longing for it, happens at the window. A character looks through the eyes of a house ..." looks out at the far hills, at the mountaintop or even the jungle, and dreams of what might be, dreams of adventure. Truby has many other examples, and he talks about various kinds of houses (the warm house, the terrifying house, the cellar versus the attic). Truly, if you have any questions about setting, developing the opposites, how to hook the characters in your story into the landscape/setting, chapter six of "The Anatomy of Story" is definitely worth the read. THIS--connecting, hooking, the story world (/setting) into the hero's arc, his journey--is really what I've been wanting to talk about. We've laid the foundation by formulating our story's designing principle and drawing the boundaries of our world. We've divided this story world into visual oppositions and we've explored the various types of settings (natural, artificial, technology) and how these can help develop the hero's journey. But since this post is already twice as long as usual, I'll save that for next time. 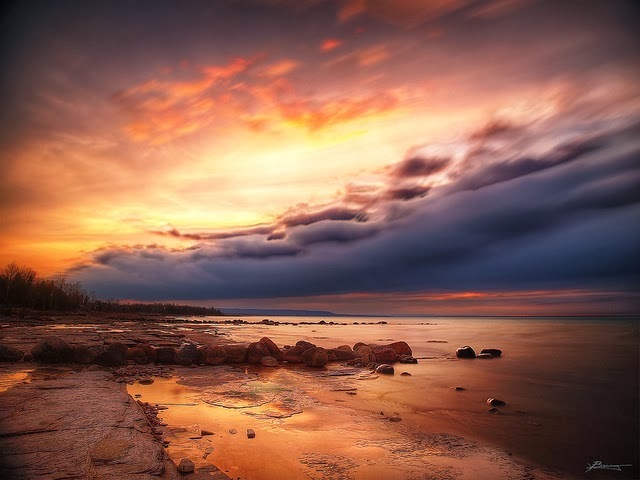 Photo credit: "almost may" by paul bica under Creative Commons Attribution 2.0.